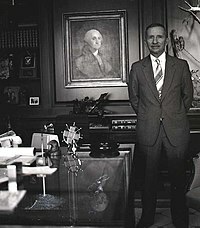 Henry Ross Perot (/pəˈroʊ/; born June 27, 1930) is an American business magnate and former politician. As the founder of the successful Electronic Data Systems corporation, he became a billionaire. He ran an independent presidential campaign in 1992 and a third party campaign in 1996, establishing the Reform Party in the latter election. Both campaigns were among the strongest presidential showings by a third party or independent candidate in U.S. history. Born in Texarkana, Texas, he became a salesman for IBM after serving in the United States Navy. In 1962, he founded Electronic Data Systems, a data processing service company. In 1984, General Motors bought a controlling interest in the company for $2.4 billion. Perot established Perot Systems in 1988 and was an angel investor for NeXT, a computer company founded by Steve Jobs after he left Apple. Perot also became heavily involved in the Vietnam War POW/MIA issue, arguing that hundreds of American servicemen were left behind in Southeast Asia after the Vietnam War. During President George H. W. Bush's tenure, Perot became increasingly active in politics and strongly opposed the Gulf War and ratification of the North American Free Trade Agreement. In 1992, Perot announced his intention to run for president and advocated a balanced budget, an end to the outsourcing of jobs, and the enactment of electronic direct democracy. A June 1992 Gallup poll showed Perot leading a three-way race against President Bush and presumptive Democratic nominee Bill Clinton. Perot briefly withdrew from the race in July, but re-entered the race in early October after he qualified for all 50 state ballots. He chose Admiral James Stockdale as his running mate and appeared in the 1992 CPD debates with Bush and Clinton. In the election, Perot won 18.9% of the popular vote but did not win any electoral votes. He won support from across the ideological and partisan spectrum, but performed best among self-described moderates. Perot ran for president again in 1996, establishing the Reform Party as a vehicle for his campaign. He won 8.4% of the popular vote against President Clinton and Republican nominee Bob Dole. Perot was born in Texarkana, Texas, the son of Lula May Perot (née Ray) and Gabriel Ross Perot, a commodity broker specializing in cotton contracts. His patrilineal line traces back to an immigrant to French Louisiana in the 1740s. He attended a private school called Patty Hill. He graduated from Texas High School in Texarkana in 1947. One of Perot's childhood friends was Hayes McClerkin, who later became the Speaker of the Arkansas House of Representatives and a prominent lawyer in Texarkana, Arkansas. Perot joined the Boy Scouts of America and made Eagle Scout in 1942, after 13 months in the program. He is a recipient of the Distinguished Eagle Scout Award. From 1947 to 1949, he attended Texarkana Junior College, then entered the U.S. Naval Academy in 1949 and helped establish its honor system. Perot said his appointment notice to the academy—sent by telegram—was sent by W. Lee "Pappy" O'Daniel, Texas's 34th governor and former senator. Perot married Margot Birmingham of Greensburg, Pennsylvania, in 1956. After he left the Navy in 1957, Perot became a salesman for IBM. He quickly became a top employee (one year, he fulfilled his annual sales quota in a mere two weeks) and tried to pitch his ideas to supervisors, who largely ignored him. He left IBM in 1962 to found Electronic Data Systems (EDS) in Dallas, Texas, and courted large corporations for his data processing services. Perot was refused 77 times before he was given his first contract. EDS received lucrative contracts from the U.S. government in the 1960s, computerizing Medicare records. EDS went public in 1968 and the stock price rose from $16 a share to $160 within days. Fortune called Perot the "fastest, richest Texan" in a 1968 cover story. In 1984 General Motors bought controlling interest in EDS for $2.4 billion. In 1974, Perot gained some press attention for being "the biggest individual loser ever on the New York Stock Exchange" when his EDS shares dropped $450 million in value in a single day in April 1970. Just prior to the 1979 Iranian Revolution, the government of Iran imprisoned two EDS employees in a contract dispute. Perot organized and sponsored their rescue. The rescue team was led by retired U.S. Army Special Forces Colonel Arthur D. "Bull" Simons. When the team was unable to find a way to extract the two prisoners, they decided to wait for a mob of pro-Ayatollah revolutionaries to storm the jail and free all 10,000 inmates, many of whom were political prisoners. The two prisoners then connected with the rescue team, and the team spirited them out of Iran via a risky border crossing into Turkey. The exploit was recounted in a book, On Wings of Eagles by Ken Follett, which became a best-seller. In the 1986 mini-series, Perot was portrayed by Richard Crenna. In 1984, Perot bought a very early copy of Magna Carta, one of only a few to leave the United Kingdom. It was lent to the National Archives in Washington, D.C., where it was displayed alongside the Declaration of Independence and the United States Constitution. In 2007, it was sold by the Perot Foundation "for medical research, for improving public education and for assisting wounded soldiers and their families." The document sold for US$21.3 million on Dec. 18, 2007, to David Rubenstein, managing director of the Carlyle Group, and is kept on display at the National Archives. After Steve Jobs lost the original power struggle at Apple and left to found NeXT, his angel investor was Perot, who invested over $20 million. Perot believed in Jobs and did not want to miss out, as he had with his chance to invest in Bill Gates's fledgling Microsoft. In 1988, he founded Perot Systems Corporation, Inc. in Plano, Texas. His son, Ross Perot, Jr., eventually succeeded him as CEO. In September 2009, Perot Systems was acquired by Dell for $3.9 billion. Perot became heavily involved in the Vietnam War POW/MIA issue. He believed that hundreds of American servicemen were left behind in Southeast Asia at the end of the U.S. involvement in the war, and that government officials were covering up POW/MIA investigations to avoid revealing a drug-smuggling operation used to finance a secret war in Laos. Perot engaged in unauthorized back-channel discussions with Vietnamese officials in the late 1980s, which led to fractured relations between Perot and the Reagan and George H. W. Bush administrations. In 1990, Perot reached agreement with Vietnam's Foreign Ministry to become its business agent in the event that diplomatic relations were normalized. Perot also launched private investigations of, and attacks upon, U.S. Department of Defense official Richard Armitage. In Florida in 1990, retired financial planner Jack Gargan funded a series of "I'm mad as hell and I'm not going to take it anymore" (a reference to a famous quotation from the 1976 political and mass media satire movie Network) newspaper advertisements denouncing the U.S. Congress for voting for legislative pay raises at a time when average wages nationwide were not increasing. Gargan later founded "Throw the Hypocritical Rascals Out" (THRO), which Ross Perot supported. Perot did not support President George H. W. Bush, and vigorously opposed the United States' involvement in the 1990–1991 Persian Gulf War. He unsuccessfully urged Senators to vote against the war resolution, and began to consider his own presidential run. On February 20, 1992, he appeared on CNN's Larry King Live and announced his intention to run as an independent if his supporters could get his name on the ballot in all 50 states. With such declared policies as balancing the federal budget, opposition to gun control, ending the outsourcing of jobs and enacting electronic direct democracy via "electronic town halls," he became a potential candidate and soon polled roughly even with the two major party candidates. Perot's candidacy received increasing media attention when the competitive phase of the primary season ended for the two major parties. With the insurgent candidacies of Republican Pat Buchanan and Democrat Jerry Brown winding down, Perot was the natural beneficiary of populist resentment toward establishment politicians. On May 25, 1992, he was featured on the cover of Time with the title "Waiting for Perot", an allusion to Samuel Beckett's play Waiting for Godot. Several months before the Democratic and Republican conventions, Perot filled the vacuum of election news, as his supporters began petition drives to get him on the ballot in all 50 states. This sense of momentum was reinforced when Perot employed two savvy campaign managers in Democrat Hamilton Jordan and Republican Ed Rollins. In July, while Perot was pondering whether to run for office, his supporters established a campaign organization United We Stand America. Perot was late in making formal policy proposals, but most of what he did call for were intended to reduce the deficit, such as a gasoline tax increase and cutbacks to Social Security. In June, Perot led a Gallup poll with 39% of the vote. By mid-July, the Washington Post reported that Perot's campaign managers were becoming increasingly disillusioned by his unwillingness to follow their advice to be more specific on issues, and his need to be in full control of operations with such tactics as forcing volunteers to sign loyalty oaths. Perot's poll numbers began to slip to 25%, and his advisers warned that if he continued to ignore them, he would fall into single digits. Co-manager Hamilton Jordan threatened to quit, and on July 15, Ed Rollins resigned after Perot fired advertisement specialist Hal Riney, who worked with Rollins on the Reagan campaign. Rollins would later claim that a member of the campaign accused him of being a Bush plant with ties to the CIA. Amid the chaos, Perot's support fell to 20%. The next day, Perot announced on Larry King Live that he would not seek the presidency. He explained that he did not want the House of Representatives to decide the election if the result caused the electoral college to be split. Perot eventually stated the reason was that he received threats that digitally altered photographs would be released by the Bush campaign to sabotage his daughter's wedding. Whatever his reasons for withdrawing, his reputation was badly damaged. Many of his supporters felt betrayed and public opinion polls subsequently showed a large negative view of Perot that was absent prior to his decision to end the campaign. In September, he qualified for all 50 state ballots. On October 1, he announced his intention to re-enter the presidential race. He campaigned in 16 states and spent an estimated $12.3 million of his own money. Perot employed the innovative strategy of purchasing half-hour blocks of time on major networks for infomercial-type campaign advertisements; this advertising garnered more viewership than many sitcoms, with one Friday night program in October attracting 10.5 million viewers. This city has become a town filled with sound bites, shell games, handlers, media stuntmen who posture, create images, talk, shoot off Roman candles, but don't ever accomplish anything. We need deeds, not words, in this city. In the 1992 election, he received 18.9% of the popular vote, about 19,741,065 votes (but no electoral college votes), making him the most successful third-party presidential candidate in terms of the popular vote since Theodore Roosevelt in the 1912 election. Unlike Perot, however, some other third party candidates since Roosevelt have won electoral college votes. (Robert La Follette had 13 in 1924, Strom Thurmond had 39 in 1948, George Wallace had 46 in 1968 and John Hospers won one in 1972, albeit from a faithless elector). Compared with Thurmond and Wallace, who polled very strongly in a small number of states, Perot's vote was more evenly spread across the country. Perot managed to finish second in two states: In Maine, Perot received 30.44% of the vote to Bush's 30.39% (Clinton won Maine with 38.77%); in Utah, Perot received 27.34% of the vote to Clinton's 24.65% (Bush won Utah with 43.36%). Although Perot did not win a state, he received the most votes in some counties. A detailed analysis of voting demographics revealed that Perot's support drew heavily from across the political spectrum, with 20% of his votes coming from self-described liberals, 27% from self-described conservatives, and 53% coming from self-described moderates. Economically, however, the majority of Perot voters (57%) were middle class, earning between $15,000 and $49,000 annually, with the bulk of the remainder drawing from the upper middle class (29% earning more than $50,000 annually). Exit polls also showed that Ross Perot drew 38% of his vote from Bush, and 38% of his vote from Clinton. Despite widespread claims that Perot acted as a "spoiler," there is little reason to think he affected the outcome of the 1992 Presidential election. Based on his performance in the popular vote in 1992, Perot was entitled to receive federal election funding for 1996. Perot remained in the public eye after the election and championed opposition to the North American Free Trade Agreement (NAFTA), urging voters to listen for the "giant sucking sound" of American jobs heading south to Mexico should NAFTA be ratified. Perot tried to keep his movement alive through the mid-1990s, continuing to speak about the increasing national debt. He was a prominent campaigner against the NAFTA, and even debated with then Vice President Al Gore on the issue on Larry King Live. Perot's behavior during the debate was a source of mirth thereafter, including his repeated pleas to "let me finish" in his southern drawl. The debate was seen by many as effectively ending Perot's political career. Support for NAFTA went from 34% to 57%. In 1995, he founded the Reform Party and won their presidential nomination for the 1996 election. His vice presidential running mate was Pat Choate. Because of the ballot access laws, he had to run as an Independent on many state ballots. Perot received 8% of the popular vote in 1996, lower than in the 1992 race, but still an unusually successful third-party showing by U.S. standards. He spent much less of his own money in this race than he had four years before, and also allowed other people to contribute to his campaign, unlike his prior race. One common explanation for the decline was Perot's exclusion from the presidential debates, based on the preferences of the Democratic and Republican party candidates. Jamie B. Raskin of Open Debates filed a lawsuit about Perot's exclusion years later. Perot attending the 2009 EagleBank Bowl in Washington, D.C.
Later in the 1990s, Perot's detractors accused him of not allowing the Reform Party to develop into a genuine national political party, but rather using it as a vehicle to promote himself. They cited as evidence the control of party offices by operatives from his presidential campaigns. Perot did not give an endorsement during Jesse Ventura's run for governor of Minnesota in the 1998 election, and this became suspicious to detractors when he made fun of Ventura at a conference after Ventura had a falling out with the press. The party leadership grew in tighter opposition to groups supporting Ventura and Jack Gargan. Evidence of this was demonstrated when Gargan was officially removed as Reform Party chairman by the Reform Party National Committee. In the 2000 presidential election, Perot refused to become openly involved with the internal Reform Party dispute between supporters of Pat Buchanan and John Hagelin. Perot was reportedly unhappy with what he saw as the disintegration of the party, as well as his own portrayal in the press; thus, he chose to remain quiet. He appeared on Larry King Live four days before the election and endorsed George W. Bush for president. Despite his earlier opposition to NAFTA, Perot remained largely silent about expanded use of guest-worker visas in the United States, with Buchanan supporters attributing this silence to his corporate reliance on foreign workers. Some state parties affiliated with the new (Buchananite) America First Party. Since then, Perot has been largely silent on political issues, refusing to answer most questions from the press. When interviewed, he usually remains on the subject of his business career and refuses to answer specific questions on politics, candidates, or his past activities. One exception to this came in 2005, when he was asked to testify before the Texas Legislature in support of proposals to extend technology to students, including making laptops available to them. He also supported changing the process of buying textbooks by making e-books available and by allowing schools to buy books at the local level instead of going through the state. In an April 2005 interview, Perot expressed concern about the state of progress on issues that he had raised in his presidential runs. Two further exceptions came with his endorsements in the 2008 and 2012 elections. In January 2008, Perot publicly came out against Republican candidate John McCain and endorsed Mitt Romney for president. He also announced that he would soon be launching a new website with updated economic graphs and charts. In June 2008, this blog launched, focusing on entitlements (Medicare, Medicaid, Social Security), the U.S. national debt, and related issues. In 2012, Perot endorsed Romney for president again. Perot did not give any endorsements for the 2016 election. During Perot's political campaigns, he spoke less on social issues and instead focused on the fiscal issues of the time. Perot did not fit the typical stereotype of a conservative southerner; his views were seen as liberal and usually focused on his economic policy to keep support during his campaigns and gain support from both Democrats and Republican voters from his home state of Texas. Perot is pro-choice, supports gay rights, stricter gun controls such as an assault rifle ban and increased research in AIDS. Since 1992, Perot was a pro-choice activist, and a strong supporter of Planned Parenthood. He has stated poorer women in particular should have access to abortions via federal funding. Since 2000, he has been pro-choice reluctantly. Perot believes tax should be increased on the wealthy, while spending should be cut to help pay off the national debt. Perot also believes capital gains tax should be increased, while giving tax breaks to those starting new businesses. We cut the capital gains tax rate from a maximum rate of 35% to a maximum rate that got as low as 20% during the 1980s. Who got the benefit? The rich did, of course, because that's who owns most of the capital assets. In his book, Perot showed support for giving tax cuts for SME's, as opposed to larger corporations. Additionally, Perot has supported a balanced budget amendment, stating: "spending should not exceed revenue for 27 consecutive years." On trade, Perot has stated that there is a trade deficit between Mexico and the U.S. and a loss of manufacturing jobs which he believes is caused by NAFTA. His position on Free Trade and NAFTA became his defining campaign principles of both the 1992 and 1996 presidential elections. Ross Perot argued: "We have got to stop sending jobs overseas. It's pretty simple: If you're paying $12, $13, $14 an hour for factory workers and you can move your factory South of the border, pay a dollar an hour for labor, ... have no health care—that's the most expensive single element in making a car— have no environmental controls, no pollution controls and no retirement, and you don't care about anything but making money, there will be a giant sucking sound going south." "... when [Mexico's] jobs come up from a dollar an hour to six dollars an hour, and ours go down to six dollars an hour, and then it's leveled again. But in the meantime, you've wrecked the country with these kinds of deals. —  "THE 1992 CAMPAIGN; Transcript of 2d TV Debate Between Bush, Clinton and Perot". The New York Times. New York Times Company. 16 October 1992. Retrieved 16 May 2016. Perot and his wife Margot (née Birmingham) have five children (Ross Jr., Nancy, Suzanne, Carolyn, and Katherine). As of 2012[update], the Perots had 16 grandchildren. With an estimated net worth of about US$4.1 billion in 2017, he is ranked by Forbes as the 167th-richest person in the United States. In 1986, Perot received the S. Roger Horchow Award for Greatest Public Service by a Private Citizen, an award given out annually by Jefferson Awards. On April 22, 2009, Ross Perot was made an honorary Green Beret at the John F. Kennedy Special Warfare Center at Fort Bragg, North Carolina. Perot was inducted into the Junior Achievement U.S. Business Hall of Fame in 1988. On September 18, 2009, the Texarkana Independent School District named him (1947 graduate of Texas High School) as a 2009 Distinguished Alumnus. In May 2009, he was appointed an honorary chairman of the OSS Society. On October 15, 2009, the U.S. Military Academy at West Point awarded him with the distinguished Sylvanus Thayer Award. In honor of Perot's 80th birthday, the bridge connecting Walton and University drives in Texarkana, Texas, was named the H. Ross Perot Bridge. On October 2, 2010, Perot was given the William J. Donovan Award from the OSS Society at the Mandarin Oriental Hotel in Washington, D.C. He is the 26th recipient of the award. In September 2011, Perot accepted the Army Heritage Center Foundation's Boots on the Ground Award. On October 28, 2011, the Perot Museum of Nature & Science in Dallas announced it was naming a new species of the dinosaur genus Pachyrhinosaurus after the Perot family. The new species is named Pachyrhinosaurus perotorum. ^ "The Ancestors of Ross Perot". Wargs.com. Retrieved June 13, 2010. ^ Posner, Gerald (1996). Citizen Perot. New York City: Random House. p. 8. ^ Reagan, Danny. "The Perot/Bordelon Branches". Archived from the original on July 18, 2009. Retrieved February 18, 2014. ^ "Texarkana Independent School District Names H. Ross Perot as 2009 Distinguished Alumni" (PDF). Texarkana Independent School District. September 17, 2009. Retrieved October 6, 2012. ^ Furlong, Tom (June 10, 1992). "Perot as Hometown Hero: Just Don't Get in His Way". articles.latimes.com. Retrieved June 26, 2010. ^ a b Townley, Alvin (December 26, 2006). Legacy of Honor: The Values and Influence of America's Eagle Scouts. New York: St. Martin's Press. pp. 89–100, 108, 187, 194, 249, 260, 265. ISBN 0-312-36653-1. Retrieved December 29, 2006. ^ Ray, Mark (2007). "What It Means to Be an Eagle Scout". Scouting Magazine. Boy Scouts of America. Retrieved January 5, 2007. ^ The Associated Press. "Ross Perot Gives $1 Million to Texarkana College". Retrieved April 7, 2012. ^ Martin, Marie Murray (March 25, 2012). "Native Son: TC benefactor Ross Perot reflects on growing up in Texarkana". Texarkana Gazette. Archived from the original on June 9, 2013. Retrieved March 25, 2012. ^ Landrum, Gene N. (2004). Entrepreneurial Genius: The Power of Passion. Naples, FL: Brendan Kelly Publishing Inc. p. 174. ISBN 9781895997231. Retrieved December 27, 2015. ^ "Ross Perot". Famous Entrepreneurs. Retrieved December 28, 2015. ^ Henry Moscow, "An Astonishment of New York Superlatives: Biggest, Smallest, Longest, Shortest, Oldest, First, Last, Most, Etc." New York Magazine vol. 7, no. 1 (31 December 1973/7 January 1974) p. 53. ^ "Magna Carta Copy Sold". The New York Times. Retrieved April 1, 2016. ^ Isaacson, Walter (2011). Steve Jobs. New York: Simon & Schuster. ISBN 1-4516-4853-7. ^ Guglielmo, Connie; Hoffmann, Katie (September 22, 2009). "Dell Pays 68% Premium for Perot's Health Technology (Update3)". Archived from the original on June 3, 2012. Retrieved September 22, 2009. ^ a b c Patrick E. Tyler (June 20, 1992). "Perot and Senators Seem Headed for a Fight on P.O.W.'s-M.I.A.'s". The New York Times. Retrieved January 5, 2008. ^ a b c George J. Church (June 29, 1992). "The Other Side of Perot". Time. Retrieved January 24, 2008. ^ Patrick E. Tyler (June 5, 1992). "Perot to Testify in Senate on Americans Missing in Southeast Asia". The New York Times. Retrieved January 24, 2008. ^ Isikoff, Michael (May 31, 1992). "Unlikely Suitors Pushed Perot Bid". Washington Post. Washington Post. Retrieved December 28, 2015. ^ "The 1992 Run For The Presidency". Reform Party. Archived from the original on January 31, 2014. ^ QUINDLEN, Anna (June 3, 1992). "Public & Private; Waiting for Perot". The New York Times. Retrieved November 13, 2012. ^ "The Pew Research Center for People & the Press: Year of the Outsider". June 16, 1992. Retrieved October 5, 2010. ^ "Time magazine cover: H. Ross Perot". May 25, 1992. Retrieved May 22, 2010. ^ "THE 1992 CAMPAIGN: On the Trail; POLL GIVES PEROT A CLEAR LEAD". The New York Times. June 11, 1992. ISSN 0362-4331. Retrieved October 24, 2016. ^ a b "Perot advisers reportedly at odds". The Milwaukee Sentinel. Milwaukee, Wisconsin. July 14, 1992. p. 2A. Retrieved May 27, 2010. ^ "Perot asks volunteers to sign loyalty oaths". St. Petersburg Times. Associated Press. July 14, 1992. p. 2A. ^ Lewis, Anthony (October 2, 1992). "Abroad at Home; Why Perot?". The New York Times. p. 31. Retrieved May 27, 2010. ^ Holmes, Steven A. (July 16, 1992). "Rollins Quits Perot's Campaign; Asserts His Advice Was Ignored". The New York Times. p. 1. Retrieved May 27, 2010. ^ Clymer, Adam (August 25, 1992). "THE 1992 CAMPAIGN: Perot Gave $12 Million to Aborted Campaign". New York Times. ^ Kolbert, Elizabeth (October 27, 1992). "THE 1992 CAMPAIGN: The Media; Perot's 30-Minute TV Ads Defy the Experts, Again". New York Times. p. A.19. ^ THE 1992 CAMPAIGN: On the Trail; POLL GIVES PEROT A CLEAR LEAD. The New York Times. New York, N.Y.: June 11, 1992. ^ Sumner, Mark (April 19, 2009). "All This Has Happened Before". Daily Kos. Retrieved June 13, 2010. ^ Perot, Ross, James W. Robinson. Ross Perot speaks out: issue by issue, what he says about our nation: its problems and its promise. p 55. Prima Pub., 1992. ISBN 978-1-55958-274-2. ^ "Presidential Election of 1912". 270towin.com. Retrieved April 1, 2016. ^ Peirce Lewis; Casey McCracken; Roger Hunt (October 1994). "Politics: Who Cares". American Demographics. 16: 23. ^ Holmes, Steven A. (November 5, 1992). "THE 1992 ELECTIONS: DISAPPOINTMENT -- NEWS ANALYSIS An Eccentric but No Joke; Perot's Strong Showing Raises Questions On What Might Have Been, and Might Be". The New York Times. Retrieved May 22, 2010. ^ Reaves, Jessica; Frank Pelligrini (October 3, 2000). "Bush plays off expectations; Gore learns from mistakes". cnn.com. Archived from the original on September 15, 2008. Retrieved August 14, 2008. Gore's decisive victory was the saving of NAFTA and the beginning of the end of Perot as even a semi-serious public figure. ^ Tharoor, Ishaan (December 15, 2010). "Al Gore and Ross Perot Debate NAFTA". Time. ^ "Open Debates: Board of Directors". Opendebates.org. Archived from the original on September 21, 2013. Retrieved November 13, 2012. ^ Richards, Paul J. "Do the debates unfairly shut out third parties?". CBS news. ^ "Point of Contact: H. Ross Perot". Dallas Morning News. April 23, 2005. Archived from the original on May 15, 2007. ^ "Ross Perot Slams McCain". Newsweek. January 16, 2008. Retrieved June 13, 2010. ^ Jason Carroll (June 19, 2008). "Ross Perot wants more focus on national debt". CNN. ^ Dinan, Stephen. "Ross Perot endorses Mitt Romney". The Washington Times. Retrieved October 16, 2012. ^ "Ross Perot on Gun Control". www.ontheissues.org. Retrieved June 16, 2017. ^ "Ross Perot on Health Care". OnTheIssues. ^ "Ross Perot on Civil Rights". OnTheIssues. ^ "Ross Perot on Abortion". www.ontheissues.org. Retrieved June 16, 2017. ^ "Not For Sale at Any Price, by Ross Perot". www.ontheissues.org. Retrieved June 16, 2017. ^ "Ross Perot on Free Trade". OnTheIssues. ^ "Forbes 400: 2017 Ranking". Forbes. October 2017. Retrieved October 17, 2017. ^ "Jefferson Awards FoundationNational - Jefferson Awards Foundation". Jeffersonawards.org. Retrieved April 1, 2016. ^ Martin, Marie Murray (September 19, 2009). "Perot receives TISD Distinguished Alumni Award". Texarkana Gazette. Archived from the original on September 24, 2009. Retrieved June 9, 2010. ^ "List of Thayer Award Recipients". West Point AOG. October 10, 2009. Archived from the original on December 1, 2010. Retrieved October 14, 2009. ^ Martin, Marie Murray (June 9, 2010). "Native Son gets birthday surprise". Texarkana Gazette. Archived from the original on June 12, 2010. Retrieved June 9, 2010. 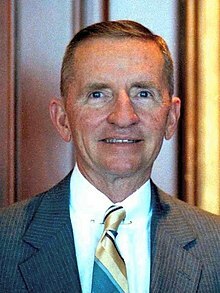 ^ "CGSC Foundation presents Ross Perot with 2010 Distinguished Leadership Award". The Command and General Staff College Foundation, Inc. Retrieved July 27, 2014. ^ Martin, Marie Murray (July 7, 2011). "Ross Perot will be presented with award". Texarkana Gazette. Archived from the original on June 9, 2013. Retrieved September 16, 2012. ^ "New dinosaur species named for Perot family". statesman.com. Associated Press. October 28, 2011. Archived from the original on November 1, 2011. Retrieved October 30, 2011. Thomas M. Defrank, et al. Quest for the Presidency, 1992. Texas A&M University Press. 1994. Wikimedia Commons has media related to Ross Perot. United We Stand, H. Ross Perot at the Wayback Machine (archived December 9, 2000); text of the book published by Perot in 1992 to mark the launch of his presidential campaign, complete with charts. The text is hosted by the site of the organization he created that year United We Stand America, as saved by The Internet Archive. Booknotes interview with Carolyn Barta on Perot and His People: Disrupting the Balance of Political Power, January 16, 1994.